Hyperbole and a Half is a blog written and run by Allie Brosh in which she uses a combination of web comic and narrative prose to describe stories of her childhood, incidences with her dogs, and advice based on her observations of adulthood. Using an intentionally artistically crude drawing style (rendered in the Mac Paintbrush program) coupled with observational and absurdist humour, Brosh has gained internet popularity since 2009 as a blogger willing to speak bluntly and openly about her own struggles with depression, social anxiety, ADHD, chronic procrastination, and other conditions. Several of her comic drawings have exceeded well beyond her blog and achieved meme status on social networking websites like Reddit, Tumblr, and Imgur. In October 2011, Brosh made a blog entry which displayed in detail her experiences with depression, which was praised both by followers of her blog and by practicing psychologists as one of the best non-medically written, and insightful descriptions of depression from the point of view of someone suffering from the illness rather than from the point of view of a medical professional observing the effects of the illness. After this post, Brosh’s blog went silent with no new material posted for over a year, causing concern among her readers. While she issued a statement regarding her absence from the blog, and answered questions during a Q&A thread on Reddit, it wasn’t until May of 2013 that a follow-up comic “Depression Part Two” was posted on her blog continuing the narrative and including a discussion on her suicidal feelings. The popularity of Brosh’s blog was seen when the post got 1.5 million views in a single day. 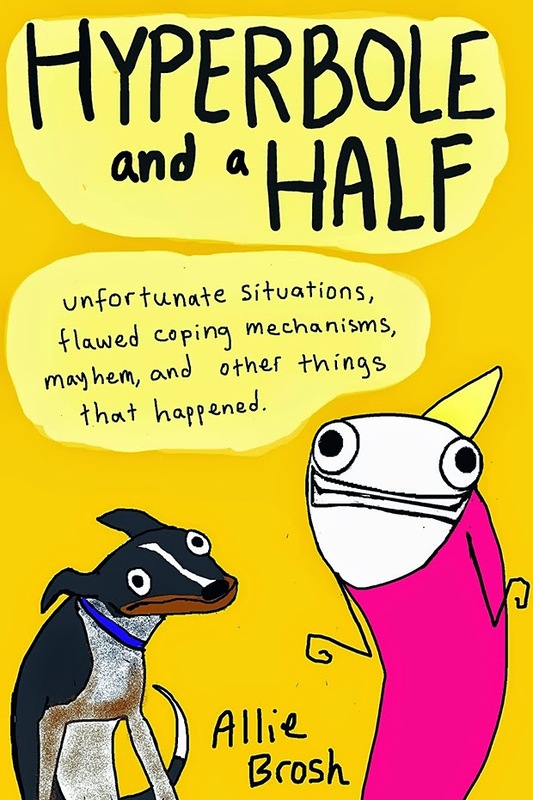 In October 2013, Brosh’s book Hyperbole and a Half: Unfortunate Situations, Flawed Coping Mechanisms, Mayhem, and Other Things That Happened was released. This book contains several of the classic and popular comics/posts from her blog (including Depression Parts One and Two), plus about ten new stories not ever published on the blog--like the first chapter in which Brosh tells of the time when (at age twenty-seven) she found the time capsule she had buried at the age of ten containing a letter written to her future self. The letter concludes with the request that her future self “please write back”; a request with which Brosh not only complies but also expands to include letters to her past self at various other ages as well. For example: “Dear Two-year-old, face cream is not edible--no matter how much it looks like frosting, no matter how many times you try--it’s always going to be face cream and it’s never going to be frosting. I promise I wouldn’t lie to you about this. It’s honestly never going to be frosting. For the love of ****, please stop. I need those organs you’re ruining” (pages 8-9). I think that what so many people (myself included) find appealing about Brosh’s writing/comic style is how approachable it is. While she's telling stories about her own life and her own weird experiences, they hit so close to home for so many people in the millennial generation who are approaching or already in their mid-twenties. When I first started following the Hyperbole and a Half blog and then later was reading the book, I started to loose track of how many times I found myself thinking "There are other people who think this way? Oh thank goodness I thought I was alone and weird." But I'm not alone, there are apparently millions of people who have similar experiences and mental processes. And we're all pretty weird. And are drawn to Brosh's deliberately simplistic drawing style and hyper-descriptive narrative text. Her story-telling method is very fluid, inserting the Paintbrush drawings so seamlessly that they are so much a part of the story that to remove them and replace them with strictly typed words describing what the drawing was attempting to convey would be akin to removing one of your kidneys and replacing it with a balloon filled with pudding. Sure it’s still vaguely kidney-shaped, and you’d still have the other kidney to take up the slack, but pretty soon you’re going to notice something’s missing. Also, you’ll probably get some kind of infection. And if that metaphor sounded weird and slightly disturbing then I’ve successfully conveyed the type of humour Brosh uses in her writing. Hyperbole and a Half: Unfortunate Situations, Flawed Coping Mechanisms, Mayhem, and Other Things that Happened is available in the catalogue at the Ocean City Free Public Library.